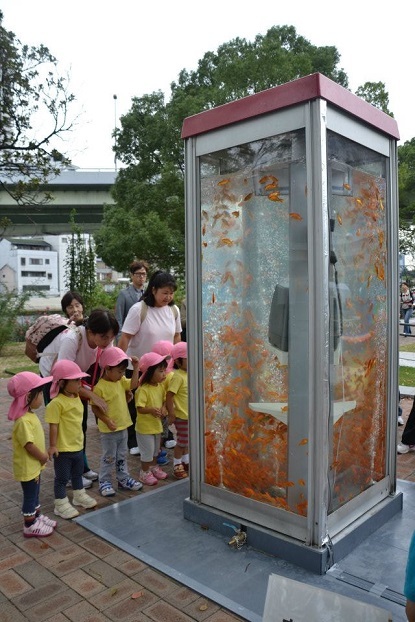 Giggle, a talented group of Japanese students who call themselves the Goldfish Club, transformed abandoned phone booths around Osaka into goldfish aquariums, trying to draw attention to these forgotten cubes of communication. And since goldfish represents prosperity and happiness, we should totally start using phone booths again for those late night romantic chats. Remember those? I used to spend my lunch breaks in them chatting away with a boy I liked. If one of those beauties was standing somewhere on my way to a meeting I would surely be late! I simply couldn’t just pass them by without taking a few minutes to enjoy the whimsical fish dance. I have no idea how you find all those fun things to share with us but please don't stop. They make my days so much brighter&fun. Ah, you are so sweet, Anonymous! Thank you for this lovely comment. Totally with you on that, little t.